Saint Birgitta had eight children, one of whom was Katarina. She was born in 1331 and died in 1381. She died when she was fifty years old. She was married away to the knight Edgard van Kyren against Birgitta´s will. In 1350 Katarina and her mother Birgitta went to Rome to get the Pope´s permission to establish a new abbey rule in Vadstena. They waited for the Pope for a very long time. Katarina never saw her husband again. He died when she had been in Rome for a couple of years. It took about 20 years to get the Pope´s permisson to establish the new abbey rule. When Birgitta got her abbey rule passed, she and her children Katarina and Birger went on a pilgrimage to Palestine. When they got back to Rome Birgitta died in 1373. Then Katarina and her brother Birger took Birgitta´s remains to Vadstena. 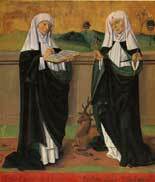 After her mother´s death Katarina became the first abbess of the abbey, in other words the one who ruled. After her death she was beatificized. Her attributes are a female deer and a lamp. When you picture Katarina, the female deer and the lamp are usually there, so you can more easily recognize her. In August 1489 her remains were put in a coffin. They are now kept in Vadstena abbey together with Birgitta´s remains. The coffin is red with golden coats of arms and is located in the sanctuary at the western end of the church. Birgitta and her daughter Katarina. From an altar piece in Hogsby church in Smaland. Swedish work, from around 1500.